Ocarina of Time Could Have Been Terrible! Yesterday IGN posted about some of the bad ideas in the works during development of The Legend of Zelda: Ocarina of Time. 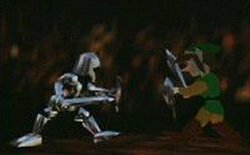 Their post discusses how at one time the whole game would have taken place entirely in Ganon’s Castle. They point out how this would have been too similar to Mario 64. Hyrule field also might not have existed because the development team thought it would be too much for the N64 to handle. At one point, Navi was only going to be a triangle (which may not have been so bad). Ingo would have burned down LonLon Ranch, which I think may have been interesting. It seems that most of these ideas stemmed from a lack of understanding of what the N64 could really pull off. I’m glad that the development team grew from the original 3 members to the large staff it eventually had. See my thoughts on a couple of these “bad ideas” after the jump. As someone who was well into my videogame prime when the N64 came out, I loved Mario 64. It was actually the first game on the N64 and my twin brother and I played the heck out of it. As much as I loved that game, I would have thought a Zelda game set up in a very similar fashion would have seemed lazy and repetitive. The IGN article details that there would be different realms within Ganon’s Castle, but I really don’t see how they could have pulled that off without it feeling like a Mario 64 ripoff. Another danger with doing that would have been that since the N64 was setting the stage for 3D gaming, many other games that followed could have fallen into the same trap. The thing I do find the most interesting as I mentioned above was the idea that Ingo would burn LonLon Ranch. How would that have happened? Would it have happened after Link entered the Temple of Time but before he was released seven years later? Or would it have been that as soon as you win Epona from him he goes stark raving mad and sets the Ranch on Fire with you trapped inside? The later would have been more epic in my opinion. However, it would have left tragic ruins for Malon and Talon to clean up and wouldn’t have been the best setting for the closing credits. So, what do you think about some of these ideas? Would you have enjoyed an entire Zelda game that took place in the Castle? What about having no Hyrule Field, do you think that would have taken away the scope and grandeur of the land of Hyrule as a whole? Be sure to let me know your thoughts in the comments!